Once your hair emerges out into the visible area of your scalp, you are dealing with a dead fibre. It is dead because there are no active growing cells in it. The implication here is that this fibre can only ever either stay in the condition it is as it emerges or wear down over time. There are no active cells within that part that has emerged to fix any damage. High or prolonged heat can physically and irreversibly change the natural structure of protein . Hair is made up of a protein called keratin. Keratin in hair has a natural twist in it called an alpha helix. This twist is present in all hair straight or curly. If you heat keratin to around 215–235°C ( 419–455F) the alpha helix starts to melt. This is a a physical change and it is irreversible, your hair will retain the shape of the melted keratin at a molecular level. Your hair shows you this molecular damage by not getting back into its natural curl or wave and staying straighter. 3. All damage to your hair is cumulative. Remember you have no growing cells in the dead part of the hair so if the cuticle is broken, it will stay broken. If you heat treat and damage the cortex, it stays damaged. Your hair conditioner and gentle treatment can help prolong the life of the damaged hair but ultimately it is damaged and the damage will continue to progress. Do you have to cut it off? If you can deal with the multiple textures and your hair is not breaking off in pieces, you can keep heat damaged hair. If the multiple textures are driving you insane, trimming is the only proven way forward. Ladies, what has your experience been with heat damage? Did you hang on to the damaged hair, or did you cut it? Life is exactly what a head of hair does not have. I think she is saying That damage can be anywhere from mild to severe. Perhaps coating your hair with products improves the appearance of damaged hair and helps manage it, yet it does not change the fact that it is damaged. I think you want to believe Argan oil can save damaged hair, but I invite you to take a look at the number of natural hair mavens on YouTube that have had to big chop after thinking their curls would “bounce” back after continuously using heat (sips tea). I cut mine. This happened in 2013. It hurt to cut it (because I was trying to let it grow long) but I knew it was necessary. Haven’t used a flat iron since, and only diffused heat now and then. My hair is much healthier now (and growing). I get the feeling some women feel they can “bring back” their hair but if hair truly does bounce back with lots of deep conditioning and protein, I don’t think it was damaged “past the point of no return.” Once hair reaches THAT point, there’s no rescue. I do think that this article doesn’t really explain the women whose hair *does* bounce back after a heat damage with the use of protein. The protein is doing its job by binding to the hair. I mean the hair still experienced damage, and a good conditioner over time on a consistent basis could build he hair structure back somewhat. 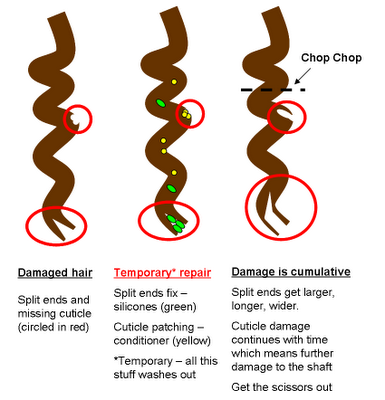 Curly hair should NEVER, EVER be blunt cut the way it’s shown in the diagram!! This will only cause more tangles and breakage; I’m pretty sure the Obagi method is the only way to correctly cut curls. Never had a good experience with any hairdresser (white or black) until I found one who would cut my hair with this method while it was dry. Yooo is it possible to damage the hair roots/ hair follicles by straightening them? I also straigthened them wet a few times fuuuuuck. And im a boy and already got a buzz cut but they still seem to grow very thin.. did this happen to anyone else?